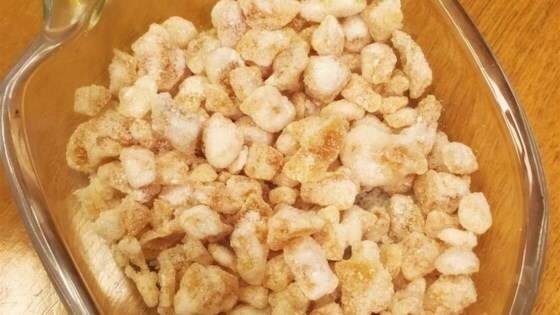 "Crystallized ginger can be served with espresso and cake or champagne and fruit, coated in bittersweet chocolate and rolled in hazelnuts or macadamia nuts. It can be chopped or julienned to use in or as a garnish for pastries, pumpkin pies, stewed fruits cookies, and many other desserts. Store in an airtight container in a cool and dark place." Cut ginger into 2-inch pieces and slice lengthwise into 1/8-inch slices. Score ginger slices by pricking with a fork. Toss ginger with sugar in a bowl. Combine ginger-sugar mixture and water in a large skillet or wok; bring to a simmer. Reduce heat and cook, stirring occasionally, until sugar melts into a syrup and starts to crystallize, about 1 hour. Continue stirring until syrup is mostly crystallized and ginger comes together in a pile in the center of the skillet and very little syrup drains out; remove from heat. Toss ginger slices gently to cool and separate from excess sugar. Spread slices out on a tray to cool and dry. See how to make a unique candied citrus treat. Use leftover sugar in coffee, cookies, or anywhere else that a fresh, clean ginger accent would be nice. I’ve been candying ginger for 40 years. My grandma lived on a farm and made everything including chicken (lol) from scratch. I used a little more water. Great recipe for ginger bars!!!!! This is a nice, simple recipe. I simmered it for about double the time but I think living next to water lengthen that time.